so.. is this what people do when they don’t have a job? anyways. here’s a quiz that i snatched from ry. 1. You have $10 and need to buy snacks at a gas station, what do you get? 2. If you had to be reincarnated as some sort of sea dwelling creature, what would you be? do i have to play favorites here? 4. What do you order when you’re at an IHOP? ok.. so don’t shoot me.. but i’ve actually only been to ihop TWICE in my life… and i think i got pancakes with strawberries on top last time. it’s pink… and probably the only piece of hot pink clothing that i will EVER have. you mean seriously? i guess that would be my broken ankle. but i’m always injured in some way shape or form by some sort of random walking into walls or tripping over my own two feet activity. w00t. 9. Of all your friends, with whom would you want to be stuck in the middle of a jungle?! 10. Are there any odd things that make you feel uncomfortable? 11. Are there any weird things that turn you on? can’t think of anything out of the ordinary. what about flavor of pudding? yea. it’s good. i like chocolate. ok. who wrote this quiz? is this supposed to be “what is your favorite prescription medication?” or “are you on precriptsion medication?” or “if you could change your name to a prescriptsion medication.. what would it be?” forget it. i can’t read minds here people!! 18. How many people on your list do you know in real life? on my lj friends list? around 32.
uh.. what happened to 19? 21. Most recent movie you’ve watched in a theater? 22. If you could invent one thing, what would it be? 23. Name a teacher you had the hots for? i can’t remember having the ‘hots’ for any of my own teachers…. 24. What’s your favorite town? 25. Favorite kind of cake? 26. What’s the first word that comes to mind right now? 28. Who got you to join LJ? i have no idea. it was so long ago. probably sar! 29. What did you have for dinner LAST NIGHT? 32. What’s the last thing you said out loud? 33. Look to your left, what do you see? 34. Who is the last person who spent $100 on you? 35. Go into your text message log on your phone… the last text you received? 36. What’s the last piece of clothing you bought? 37. If you could be alone with anyone right now who would it be? 38. What do you look for physically in a partner? eh.. physical apearance doesn’t really matter much to me. but i guess… smile. hands. legs. muscles. 39. Whats the saddest thing that’s happened to you? 40. What is your motto in life? yea.. so i randomly took a trip up to our cottage for a day or so. ok. so we blogged about this before. but here we go again. 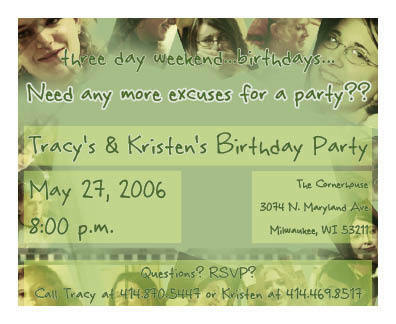 if you are in milwaukee.. come to mine and kristen’s birthday party at the cornerhouse. you are all invited… and bring friends!! LOTS OF THEM! 🙂 so… with all this hard work that we are doing… you are all coming to our gig on friday…. right? hi all. it’s kristen. i’m taking advantage of tracy’s massive connections to post another event that she somehow forgot to mention….AFTER the Friday gig….on SATURDAY night….we’ll be having a birthday party! email or call with questions, and we’ll see you there!! no.. really. my feet are cold. but really that’s all i have to say right now. my back hurts.. i think i’m gonna go lie down again… and then maybe i’ll play some more drums. i’m gonna *hopefully* be practicing a lot this week.. ‘why?’ you ask? well because of the upcoming metafour gig this friday of course! speaking of metafour… i made us a myspace… so go check that out and feel free to add us if i haven’t already added you 🙂 and don’t forget to come to our gig on friday. there are three other bands playing that night… and they are all face-rocking awesome. you don’t want to miss it. the people in my life have just made this one of the best birthdays ever. i’m so tired.. so i can’t write too much about it.. but lets just say i got text messages / phone calls from four different countries… numerous myspace comments and several in person “happy birthday” greetings. i’m overwhelmed by the outpouring of love that i have received today. oh and guess who i went to dinner with? oh how i love that family! i had so much fun with the torbits and ferdi and his friend.